Sallas Auto Repair has dedicated itself in providing our Kansas City and Overland Park customers with the highest quality auto service and repairs. Our experienced ASE - Certified auto technicians will provide top quality repairs to any of your car's systems - brakes, electrical, cooling/heating, fuel, suspension and engine. We are also ready to assist with your vehicle service and maintenance. An oil change is a part of any regular maintenance schedule for your car. Check your owner’s manual and follow the manufacturer’s recommendation. If it says change the oil every three months or 3,000 miles and you haven’t traveled 3,000 miles in that time, change it anyway. For flat tire repairs, tires must be returned to Sallas if within a 10-mile radius of our store locations. Outside of this coverage customer can have tire fixed and send us the receipt, we will cut a check out of the main store and mail it to them within 3 business days. Up to a $20.00 reimbursement. 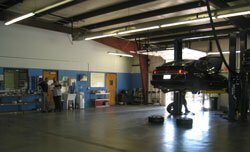 We will come to the customer’s home or business (within 20-mile radius), air up the tire, bring the tire or vehicle back to our shop, and repair the tire at no charge to the customer.